If you are interested in vintage singing more than in verismo histrionics, this is the Pagliacci for you. Although they're lively enough, theatrically speaking, these performances are refined, and that may be a very good thing if you usually think Leoncavallo's two-act shocker is cheap. The recording was made in RCA Victor's New York City studios in January 1953. The team of producer Robert Mohr and engineer Lewis Layton was on hand to ensure the best possible results. (If RCA Victor had held out for two or three more years, this could have been a hot "Living Stereo" LP.) 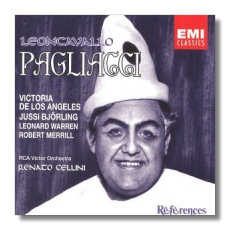 Pagliacci was not an important opera in either Björling's or de los Angeles's repertoire. In fact, EMI's annotations indicate that Björling "avoided the role in the opera house" (I guess that means "seldom if ever"), and de los Angeles didn't perform it live until 1961. Nevertheless, they sing the music with involvement, and in peak vocal form. Instead of anger, Björling finds an almost noble tragedy in Canio. De los Angeles, while not precisely lady-like as Nedda, doesn't turn her into a free-wheeling slattern, either – her Carmen had much the same quality. Surprisingly, Björling's Italian has its problematic moments, even at this relatively late stage in his career. Leonard Warren's inherently dry tone doesn't spoil a magnificent performance of the Prologue. In the opera itself, he seems resistant to baser emotions, emotions that Tonio arguably must have. I am glad, though, that he was given the opportunity to declare "La commedia è finita!" at the end, just as Leoncavallo asked. (The libretto credits it to Canio, but it is wrong.) Silvio's ardent love-making is well-served by Robert Merrill, and his duet with Nedda is the disc's highlight. Beppe's Serenade is done stylishly by Paul Franke. Strong choral work from Shaw and company is no surprise, but at times the recording balances it awkwardly. The solo voices are extremely prominent throughout, and the absence of dramatic effects places this recording squarely in the first half of the 1950s. Having said that, the sound quality holds up well. Cellini's conducting is on the good side of routine – no special insights here. EMI's booklet contains the texts and translations, and yet everything fits in a standard jewel box, unlike the earlier CD release of this recording. In short, this is the Pagliacci with the beautiful singing, and that's all the justification I need for having it.